Architects: Ian fraser, John Roberts & Partners. Roof Design and Engineering: Geiger Berger Assoc. P.C. ; Horst Berger, Principal-in-charge of design. Architects: Zeidler Roberts and Partners, Toronto, Canada. Design Consultants and Structural Engineers for the Roof Structure: Geiger Berger Assoc.P.C. ; Horst Berger, Principal-in-charge of design. The Cynthia Woods Mitchell Center For The Performing Arts – Woodlands, Texas, U.S. Original Structure – Horst Berger Partners, Cons. Eng. 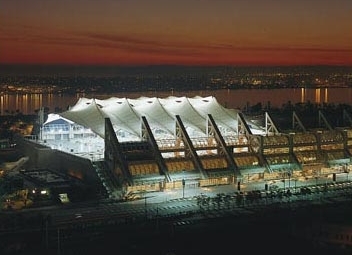 San Diego Convention Center – San Diego, California, U.S. Structural – John A. Martin & Associates, Inc.